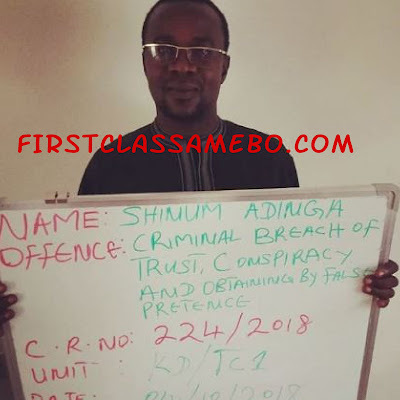 The Kaduna Zonal Office of the Economic and Financial Crimes Commission, EFCC on December 18, 2018 arraigned one Shinum Adinga before Justice Muhammed Muazu of the Kaduna State High Court on a two-count charge bordering on criminal breach of trust and obtaining by false pretence. Adinga had deceived his victim into parting with N4,050,000 in instalments in the belief that it was being invested in a ginger farming business, which turned out to be false. nder Section 1(3) of the same Act”. He pleaded “not guilty” when the charges were read to him. Prosecuting counsel, Onyeka Eze, asked the court for a date for trial to commence. Defence counsel, Y. Makarfi, however, urged the court to grant his client bail. While adjourning to January 29, 2019, Justice Muazu, granted the defendant bail in the sum of N1million with one surety in like sum who must be a public servant not below grade level 16 with a landed property within the jurisdiction of the court covered by a Certificate of Occupancy.